Printer looks good.. will be interested to hear how you get on with it. Am very intrigued by the tips of your slippers... so MY colours!! lol! 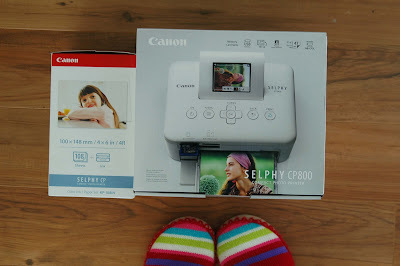 I LOVE LOVE LOVE my selphy printer! plus you can do mini photos.....and very light weight and portable!!! Oh, please do a review, including costs, ink usage, etc. I have a beast of a machine, Canon i9900 and just discovered it doesn't want to work with Windows7 but works just fine with the new Mac. I have one of these that my lovely sister bought me for my Birthday and I LOVE it and you will too. Well once you have the chance to play with it!! I want one and I want your slipper! Can't wait to hear how you like your printer! I've had mine for 2 years and I've put it to work since I had my baby, and I love it!! I love the WiFi capability because I take so many pics with my phone! Do you have to buy a different cartridge/paper pack to do minis? ?